Rustic Country Wedding : Candlelight Farms New MIlford. 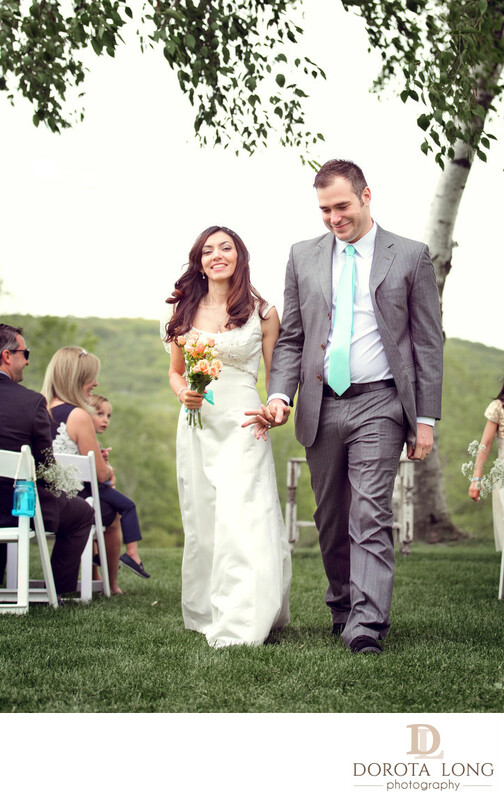 This country wedding in Candlelight Farms Inn in New Milford, CT was a very small wedding. The weather was not perfect that day - it was overcast but at least it did not rain. The first thing that I noticed when I went and photograph this event was how happy the couple was! In this photograph they were both happy walking down the isle after their ceremony. You can see at the back the sky was bright white which means it was cloudy but at least it wasn't raining. The couple, after the ceremony, held each other's hands and happily walked away together. It was a very small wedding and only some closest family members were present. Candlelight Farms Inn in New Milford is a perfect wedding venue in CT for those who look for a private location as well as country feel to it. The area of the property was large enough to take some variety of shots in different locations. It was early spring and the trees and the grass were bright green. I used my 70-200 lens most probably at 70mm to take this shot. I chose to use this lens because of how versatile it is. I don't have to stand very close but I can shoot at 200mm and I have a very clear picture of the bride and groom.